As promised last week – we present you a short interview by Coaltrans, where our Founder and Editor shares his views on the challenges that the Polish coal industry is facing, the opportunities for investors in Polish coal assets and on the role the government has played so far in restructuring Poland’s coal sector. What do you think is the biggest challenge facing Poland’s coal industry in 2016? Well, definitely creating a new Road Map for domestic power sector is the top priority, since without having one it will be tough to define goals for each energy related industry, including coal production. The latest strategy was presented in summer last year, but it was written in the period of election tensions and therefore there was no time for further analysis of the scenarios presented in it. There are many good signals for hard coal sector coming from the Ministry of Energy, yet lack of such Energy Road Map causes uncertainty for strategic investments in all the links of coal market chains. When the situation will get stabilized, then we would know which directions each coal market participant should take: either it will be development of sized coal segment in their portfolio, or should they focus on the industrial consumers? Either Poland should consider more on increasing export, or should it limit its production to domestic market and focus on local demand? Poland has seen a number of foreign investors in its mines in recent years. 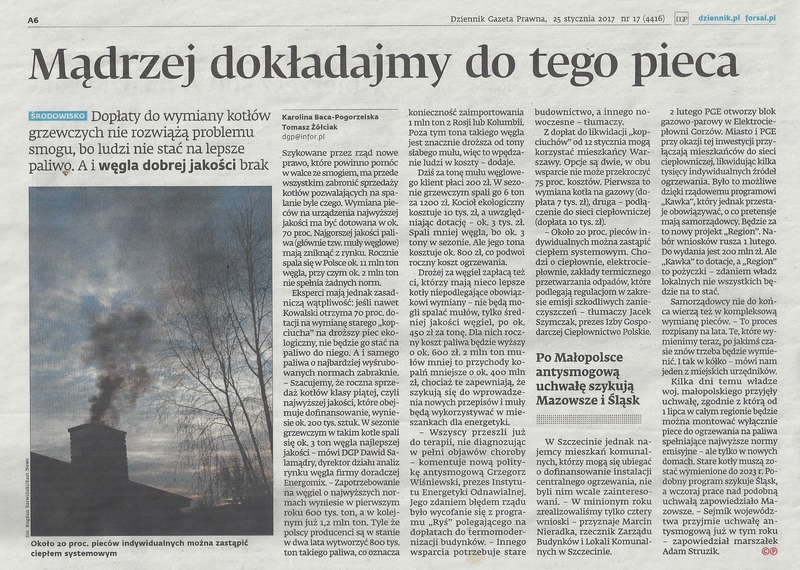 Do you think there are many outstanding viable opportunities for investors in Polish coal assets? There are a few interesting projects of new or rebuilt hard coal mines in all the Polish basins. We have Australian Prairie Mining planning to build a mine in Lublin Coal Basin, we have German HMS Bergbau that plans to set their operations in Upper Silesian Coal Basin next to Krupinski mine, there is also Polish Kopex, which still did not drew a line under the idea of building a mine in Lesser Poland. Finally, there is Balamara Resources which for quite some time was making plans of anthracite production in Nowa Ruda, but recently was more interested in taking over Makoszowy mine from Mines Restructuring Company and following the scheme, once successfully performed by Czech EPH with PG Silesia’s shake-up. And although due to the adverse global situation and internal turmoils in Polish coal sector they all had to slow down their operations, most of them are still moving forward. Personally, I am all for private bottom-up investments in the domestic coal mining industry, as far as they are serious and legit. I believe there is a field for both types of coal producers: state-owned, strategic for homeland energy security and private, which will be more flexible and market-oriented. How successful do you think the government has been so far in restructuring Poland’s coal sector and what more should be done to make the industry sustainable long term? Read the whole interview at Coaltrans Poland website.